First off, I owe a HUGE apology. The kind folk at Usborne sent me this ARC months ago and due to many reasons (uni, family, reading slump, reviewing slump and so on) I couldn't get around to it till earlier this month...and since I went into a blogging hiatus around then, I couldn't get around to reviewing it (and a whole lot of other books too, but that's a talk for another day) as soon as I would have liked to. Anyway, I'm glad this book was what I started the year with because it was so, so important! 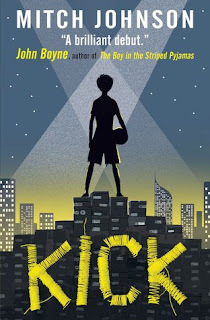 Let me list why this is a must-read for anyone who likes MG, YA, or you know, reading in general! ⚽ The subjects it deals with- from East-Asian sweatshop workers to human trafficking, the author touches upon a lot of important issues through the story. It was an eye-opener of sorts to see what Budi went through, be it at home, at work, or in his neighbourhood. ⚽ Take Budi himself. Budi comes from a poverty-stricken family in Jakarta, Indonesia, consisting of his parents and his paternal grandmother. He cannot afford to go to school, which is why he works at a factory that makes boots for professional football players. The character was brilliantly portrayed, be it how Budi had hopes and dreams for his future as a footballer despite his bleak situation or how he slowly comes to realize that things aren't just that easy in real life. As if all this wasn't enough, he also has to deal with a genetic condition that doesn't allow proper clotting of blood (this leads to complications like constant bleeding when wounded and even internal bleeding when things are very serious). ⚽ Budi and Rochy shared a heart-warming friendship and it was lovely to see what they went through- how friendships are made and broken at such ages and how despite everything, they still have fun. Be it playing football, watching matches on TV or ardently following their favorites, they still found something to love and bond over and it was just perfect? ⚽ And then there's Budi's family- his mom and dad strived to keep him as happy as they could and Budi's grandma was one amazing person. I loved the moments Budi shared with her and how he looked up to her and this, along with Budi's friendship with Rochy, was one of the best things in the book, in my opinion. ⚽ The storyline! Here, I admit, I'm in two minds about. While I was really happy with how things turned out towards the end, I couldn't help but wish things went in another direction. I don't do spoilers but oh, I really wish Budi had something more in store for him. Despite it all, I loved the twists and I love how the bottom line here is that dreams may not always come true, but you can still be happy with what you have- and relationships are important, be it family or friends. ⚽ The writing is to the point and nothing fancy (and it suits the tone of the book just right), but if I were to say what makes this book as special as it is, I'd say it's in the way how the author laces positivity through everything. I wasn't very sure about the Slumdog Millionaire comparison at the beginning but once I finished this book and thought back on the course of the story, I'd say the comparisons are justified. You'd love how everything bleak still shines with hope and that's...that's everything. All in all, while this wasn't a perfect book by all means, it was still a pretty impressive debut- a clean goal- and I cannot wait to see what the author would come up with next!